The Website Custom Audience Pixel is a powerful component of Facebook’s advertising platform that lets you create Facebook Ads that target people who have visited your website. This digital marketing strategy, called retargeting, is an effective way to send potential customers who have shown an interest in your business back to your website. Read on for a quick breakdown. At the highest level, Website Custom Audiences (WCA) can be used to create three specific groups of people: users who have visited your website; users who have already converted on your site; and users who have similar interests and demographic characteristics to those who visit your site, known as a lookalike audience. Create a WCA to retarget users who have visited your website with highly relevant ads based on the specific pages they visited. Create a WCA to exclude users who have already converted, or completed your desired action, from your ad. Use a WCA to create a lookalike audience to attract potential customers with targeted ads. From the data collected by the pixel, you are able to create up to 10,000 Website Custom Audiences (WCA) per Facebook business account. 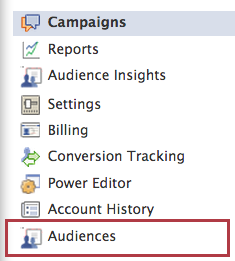 These audiences can then be targeted through Facebook ads. To get your Website Custom Audience Pixel, go to the Ads Manager for your business page at facebook.com/ad/manage and select Audiences from the left column menu. Follow the prompts to get your tracking pixel. Once you have your tracking pixel, copy and paste the code between the header tags of your site or provide it to your web developer to add it for you. If you have a website powered by SnapRetail, there’s no need to access your website’s HTML code. Instead, simply paste the Facebook tracking pixel into the Facebook Custom Audience box at the bottom of the website tab and click to save. This will add the tracking pixel to your home page. Add pixels to individual custom pages by clicking to edit the Page Name/SEO and pasting it in the designated area. Depending on the amount of traffic to your website, it can take anywhere from a few hours to several days before the pixel has collected enough data to be able to create a WCA. The pixel needs to gather data on at least 20 visitors. You can set the number of days in which a website visitor will remain in a specific custom audience, up to 180 days after a visit. The number of days a person has been in an audience will reset after each visit. Facebook’s Website Custom Audience tool is the perfect stepping stone into digital remarketing. It is easy to implement, easy to manage, and easy to track the return on your investment. Retargeting is all about delivering relevant messages to the right target audience, and WCA work to do just that. It’s quickly becoming one of the most efficient ways to attract and convert website visitors into paying customers.